A fun way to introduce you some of our favorite wines in the store that we believe would make great gifts! It's always a great story when some obscure, indigenous grape variety is coaxed back from near extinction by a passionate winemaker. It is a story that happens only in the ancient wine producing regions of the world, places where historically wine has been made for centuries. Our story for this post is about Spain and a region in the Northwest quadrant called Bierzo. The first written record of wine making in the region was some 2000 years ago by Pliny the Elder and it is continually mentioned throughout history as an important area where grapes were cultivated by the Romans and later by the Christian monks who set up monasteries and hospices to help the pilgrims on their journeys to Santiago de Compostela. Then phylloxera arrived and nearly wiped out Bierzo and it was a very long, slow process to breathe life back into this obscure little region. But in the 1990's a famous winemaker, Alvaro Palacios, visited Bierzo and saw the potential in the region with its incredibly steep hillside vineyards, distinctive terroirs, and most importantly, ancient vineyards of Mencía—a unique red grape believed brought by French pilgrims during the Middle Ages. He got distracted by another promising region, Priorato, for a time but he never let go of his dream to make wine from old vine Mencia in Bierzo. Our featured wine, the Pétalos del Bierzo, is the entry level, but it’s always a serious effort. Produced from biodynamically farmed small hillside parcels of 60-100 year old vine Mencia grown in rocky slate soil around Corrullón, the wines are bottled without fining or filtration. Petalos has been a long time favorite of the store since I tasted it with Matt Lirette more than 8 years ago and it just seems to get better and better with each year. Beautiful nose of lavender, incense, spice box, black cherry, and cranberry, with nice weight on the palate, intensity, and layered fruit, it would make a great gift for anyone who can appreciate a well made, balanced with with a great history. "Expressive black cherry, currant, licorice, mineral and smoke flavors mingle in this focused red. The texture is gentle but firm, with well-integrated tannins and racy acidity providing structure. A compact wine that shows good intensity. Drink now through 2023. Our next wine of Christmas is a high-quality sparkling that can rival Champagne but from my favorite place in the world! I'll admit, it took me a long time to appreciate Franciacorta. As a women obsessed with Italian wine who is in the business, you wouldn't think it would take almost 8 years to get "it". But in my defense, the problem with Franciacorta was that its availability in the US had been scarce and with only 11% of its production sold abroad, it was something I rarely got to taste. Then I went to northern Italy for the first time and Franciacorta was everywhere! And affordable - and made by producers I'd never heard of - and I could drink a different one everyday to start my meal. I became obsessed with tasting every Franciacorta I could find! And I finally got "it". High quality bubbles that could rival Champagne from my favorite place in the world? What a no brainer! So after that visit in 2014, I came back home and started asking our wholesalers about Franciacorta and excitedly they have been trickling into the market. Berlucchi, Ferghettina, Bellavista, Ca del Bosco, Cantadi Castaldi, Montenisa, Barone Pizzini...I'm was so excited that we bought a new shelf just to accommodate all of the Franciacorta (as well as the 50+ different bottles of sparkling from all over the world! ) I want to buy! Which brings us to my next in the lineup of 12 wines of Christmas, the Ca' Del Bosco Cuvee Prestige, the elegant wine in the elegant package that has been a staple on our shelves and at the bar since I returned from that trip. It is a great way to introduce people to the quality bubbles from the region. We were able to visit there this year and the property is as stunning as their wine! The Cuvee Prestige, a staple on our shelves and at the bar. Today's feature is about a region, so you are getting 3 wines in one post! Packing the punch of extraction and purity of fruit that equal some of the best the New World has to offer, the wines of Valpolicella, and especially those made in the Recioto and Amarone styles, are the perfect "gateway" wines. In terms of wine gifts, one of the great things about Valpolicella is that you can experience the different aging and vinification processes across a spectrum of price points and styles. Basic Valpolicella is usually priced in the teens, Valpolicella Classico and Superior are priced in the high teens to low 20's, Ripassa style usually starts in the 20's to mid 30's, while most Amarone and Recioto (Recioto is sold usually in 375 ml bottles) wines begin in the $50 range and go from there. It all starts with Valpolicella, an area within the Veneto region of Northeast Italy around Lake Garda. Like “Chianti”, Valpolicella is a region, not a grape and the red wines produced there are blends dominated by Corvina, with Corvinone and Rondinella usually lending support. Molinara, Negrara, Rossignola, Dindarella and a few other local varieties are also allowed, although have diminished in importance. But it is Corvina that forms the backbone of the blend with its silky tannins and deliciously fruity, smoky red cherry flavors and aromas with the deeply colored Rondinella grape adding red currant and citrus components plus color-intensity to the blend. Recioto, by most accounts came into fashion during Roman times when wines were made sweet and high in alcohol to preserve them during long travel. The Romans are also said to have developed the process of “appassimento”, in which the grapes were dried in farmhouses on straw mats which transforms them into shriveled, sweet, tiny concentrated berries. To make Recioto, they press these tiny dried berries but stop fermentation early to retain the high sugar level. Amarone is said to have come about possibly as a mistake, someone left a barrel of Recioto unattended too long, the yeasts in the barrel continued to work and the wine fermented to dryness. Now aged a minimum of 25 months in oak, they are densely concentrated and deeply colored with luscious ripe fruit balanced with a savory core of alcohol, acidity and tannins. Think leather, coffee, chocolate, stewed blackberry fruit all wrapped up in a rich, viscous and heavenly concoction that just so happens to come out of a wine bottle. Currently we are carrying a few different styles of Valpolicella, each chosen for their unique expression of the region, vinification process and quality. But as with everything else in our store, my selection changes frequently although you will always find at least one Valpolicella on our shelves. Our 4th wine of Christmas is made by a female French winemaker with a famous winemaker father. It's not often that I fall for a California wine. Italy and France are my wine drinking countries of choice - I like acid, lots of structure and subtle fruit and I'm fine with a little oak on my wines as long as I can't taste it or smell it! That being said it is really nice when I find US producers that make wine with an old world sensibility. I tasted one such wine with Beth Reinhard a few years back when she was still working for Republic. She didn't tell me what it was and the label gave nothing away so I was left to form an unbiased opinion based on purely on my nose and palate. Both of which told me old world, probably right bank Bordeaux due to the softer tannins and more blue and black fruit, not young - there was definitely secondary and some tertiary flavors - but not old either. When Beth revealed the origins of the wine I liked it even more...it was a Bordeaux blend made by a young female French winemaker in Sonoma; 2009 vintage and the first vintage she ever made! But she wasn't just any young French woman as her famous father was Pierre Seillan, a revered veteran of the industry. 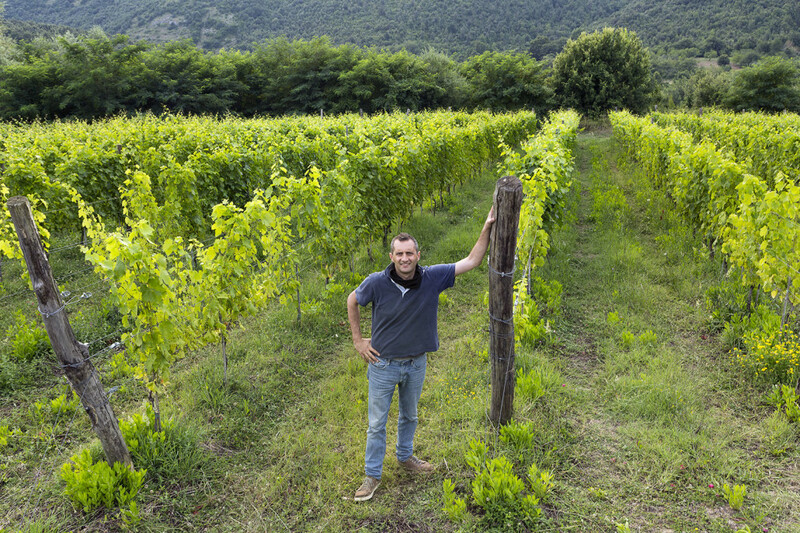 Pierre is the current winemaker at six properties sprawled across multiple winemaking areas: Vérité and Anakota in Sonoma County, Château Lassègue and Château Vignot in Saint-Émilion, Arcanum Valadorna in Tuscany, and Bellevue Seillan in Gascony. It was at the very last property on that list – Bellevue Seillan, a family estate – that Pierre began his wine career. Pierre then did some work in the Loire Valley and Bordeaux. But Pierre’s real breakout project came some time later – and on the other side of the Atlantic Ocean. In the mid-1990s, Pierre came to America, to Sonoma, and created Vérité. Vérité’s wines have garnered high praise from the critics, including seven 100 point scores from Robert Parker. Obviously the apple doesn't fall far from the tree as the 38-year-old Hélène Seillan began her career in the wine business seven years ago while working as assistant winemaker her father's Bordeaux property where she also received her degree in Viticulture and Oenology. She split time between France and Sonoma where she became fast friends with artist Julia Jackson of Jackson Family Estates. Cenyth represents the ‘second generations’ of two families coming together to showcase an artistic expression of the place they call home, Sonoma County. Hélène Seillan creates the art inside the bottle while Julia Jackson created the art on the label. It is two women, working together to carry on a friendship that started almost 20 years ago. The 2010 Cenyth is composed of 54% Merlot, 34% Cabernet Franc and 12% Cabernet Sauvignon. The alcohol is 13.4% and the fruit was sourced from the same vineyards. Very Bordeaux-like (no doubt due to the lower alcohol profile), it offers up notes of red and black currants, cedarwood, spice box, vanillin, licorice, underbrush and unsmoked cigar tobacco. The wine reveals fine-grained tannins and beautiful density and richness. Compared to the 2009, which is a Medoc-like blend, the 2010 is more of a right bank St.-Emilion-styled wine. The first time I tasted a wine from the Etna, I knew that something very special was happening in the eastern part of Sicily. We were in New York in late January of 2009 for an Italian Trade Commission wine event and we needed a bottle of wine for our friend Lisa's birthday party. I had become intrigued by the region while researching the wine producing areas of the island for our wine and culinary tour later that year, but there was nothing from the Etna in any of our wholesaler's portfolios. In fact, like me most had never even heard of the region until I started inquiring about the wines. So, needing a bottle of wine to take with us to a little party, we popped into a shop in the East Village, that actually had a decent selection of Sicilian wines and there on the shelf was a wine by one of the producers I had been researching, Terre Nere. The 2006 Etna Rosso was under $20, which was very reasonable for anything coming from the area, so I was really excited to try it. 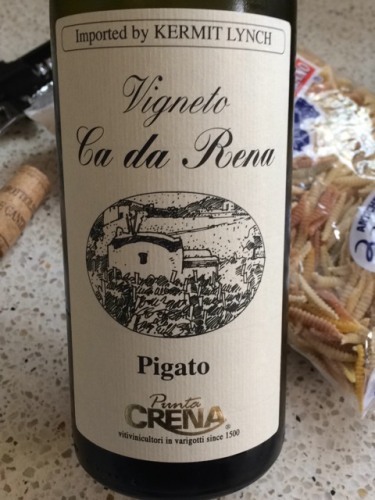 And needless to say we were all impressed as it was lush (a prominent quality in the 2006 vintage) and easy drinking, with a purity of fruit and hints of dark cherries, tobacco and wild herbs, it had an earthiness and texture reminiscent of Burgundy but is distinctly Sicilian. Made with Nerello Mascalese, a native grape to the region, I was hooked and needed to know more about this region. Our friends at Uncorked had access to the Terre Nere wines and got samples brought in for all of us to try - I still remember standing at our bar tasting the entire line up with Nick Selby and how impressed we were - impressed enough for Uncorked to take the risk and bring in whatever the importer could allocate for Uncorked's annual portfolio tasting. And arriving with the wines was the producer himself Marco de Grazia, considered one of the pioneers of the region. You can imagine how excited I was when Marco agreed to host an intimate, seated tasting of his wines at the shop as well as a few others he is importing. Soft spoken, loquacious and extremely passionate about the region, it was wonderful to hear about his approach to wine making on the Etna, to taste the wines with him and hear his stories about what makes this area so special and still one of the most exciting wine producing regions in the world today. And while it is the reds from the region that first captivated me and receive the most praise from the press, the whites are truly extraordinary. The indigenous Caricante with its crisp acidity, racy minerality and aromatic, pure, and lemon, tart apple and white peach fruit can be reminiscent of great Chablis when in the right hands. It has excellent ageing potential, copes well with the searing summer heat and cold winters on Etna, and loves the black lava soils. So it is the Terre Nere single vineyard white that is my 3rd wine of Christmas, but I do adore his regular Etna Bianco as well. 2014 Terre Nere Cuvée delle Vigne Niche Calderara Sottana Etna Bianco -The Calderara Sottana is a cru vineyard, producing the highest quality grapes at a high elevation. By far the rockiest cru in the appellation, in the roughest parts you can’t see the soil for the black volcanic pumice carpeting the vineyards. "Niche" is the local dialect for small plot and this particular plot is on the north side of the Etna at an elevation of 600-900 meters. Large used French oak barrels are used for 10 months of aging and then another 3-4 months in the bottle before release. Yellow flowers, minerals, lemon zest and a touch of smoke on the nose. Densely packed, bright and juicy, offering orchard fruit, flint and herb flavors. Finishes vibrant, complex and long. This is a super small production wine that would work best for a collector or anyone who loves high quality, high acid white wines from one of the most unique terroirs on the planet. Great for a Chablis drinker or Loire Valley wine lover who wants to venture out in to new and exciting territory! Under $35 and a steal for the level of quality here. The "villa" at Alloro Vineyards was designed to reflect owner David Nemarnik's Italian heritage. The first time I heard the name Alloro Vineyards I was on a plane to Portland for our first trip to Oregon in 2012. Anytime you are headed to wine country, anywhere in the world, people have opinions on where you "must go". As this guy spouted off about Alloro to his friend, I didn't pay much attention to him, but I did file the name in the back of my brain for future reference. As you drive down Highway 99 from Portland into the Willamette Valley, the first AVA you hit is Chehalem Mountain with the town of Sherwood marking the entrance to wine country. Blue and white signs along the road announce which wineries are where and your heart starts to beat a bit faster just thinking about all of the delicious wine that awaits you. And as we came through Sherwood on that initial drive down through the valley, one of the very first blue signs I see is for Alloro Vineyards. Including the location of the winery into that file in the back of my brain, we drove on through Newberg, then Dundee and Lafayette, stopping finally in Carlton to check into our apartment. That evening at dinner James Moises is talking about other wineries that have approached him about distributing their wines in New Orleans. Again the name Alloro comes up and I realize that after the third mention in a day, I need to pay attention. So James ends up visiting the winery the day we leave the valley and is incredibly impressed with the place, the wines and the people. Yes, he picked up the wines and it was love at first sip for all of us. Fast-forward to 3 years later and the wine is still one of our favorites with the 2012 holding a spot on our shelves as well as our wine list. And I can honestly tell you that anyone who tries it at the bar, more often than not, walks out with a bottle! The 2010 was the first vintage we tasted - we knew then how special it was! 2012 Alloro Pinot Noir - A terroir driven wine displaying ripe black cherries, candied cherries, and rose petal, with subtle hints of cinnamon, clove, and nutmeg. This is a fuller bodied wine that reflects the vintage with lively acidity, and very broad and fine texture that lingers nicely from the palate. 1,600 Cases Produced. Thanks to Matt Lirette of Lirette Selections, we met Anne Charlotte Melia this past summer in New Orleans just before we left for Europe. It was perfect timing - when she returned to France the following week we would be in the Rhone Valley and she invited us to visit at her family winery in Chateauneuf-du-Pape. Chateau La Font du Loup (the fountain of the wolves), gets its name from the ancient natural spring that flows through the estate. Legend has it that wolves from nearby Mont Ventoux would stop to drink at the spring as they made their way to the Provençal plains. The Château was acquired by the Melia family in 1942 and today, Anne-Charlotte, the granddaughter of the founder, and her husband, Laurent, oversee the estate and the winemaking. La Font du Loup, the fountain of the wolves is an ancient natural spring that flows through the property. We visited Charlotte in June and were very impressed by the elegance of her wines that she attributes to their estate's unique terroir. Located at one of the highest points in Châteaneuf-du-Pape, Château La Font du Loup, has 20 hectares of organically farmed vineyards, including holdings in the La Crau and Font du Loup. Planted on a north facing slope with mostly sandy soil and vines that reach 100 years old, the vineyards are located in one of the coolest spots in the appellation which allows for a slow ripening of the grapes. As for her part, Charlotte's minimalist approach in the cellar ensures that the wines are never over-extracted, are vinified at cool temperatures and that no new oak is used. The results are wines that exhibit a purity and freshness not often found in the region. The 2014 Chateau La Font du Loup Cotes du Rhone is made with a blend of 50 year old Grenache and Syrah that is hand harvest with a meticulous selection of grapes. The nose gives red and black fruit aromatics along with lavender floral notes. On the palate, the wine is medium-bodied and fresh with silky smooth tannins. Black cherry liqueur, ripe black plum and black raspberry flavors linger in this wine that exhibits considerable elegance and finesse. So if you are looking for a great gift under $20 that expresses the elegant touch of a female winemaker from one of the most famous and approachable wine regions of France, this is your wine! Visiting Domaine Fondreche, Southern Rhone at its Best! The Ventoux is a mecca for wine and cycling enthusiasts! This past summer we deviated from our usual routine of spending our entire vacation in Italy and spent time in Southern France. It was a magical week in a beautiful village at the base of the mighty Mont Ventoux spent cycling, immersing ourselves in the local culture and enjoying the village markets from which we cooked the most delicious meals in our little Provencal house. We had such an amazing time that we've already booked another trip there next year and are hoping to schedule a customer tour there in the near future. The village of Bedoin, located at the base of the Ventoux. Why the Ventoux you ask? Because it is a wine and cycling mecca! People (including us!) come from all over the world to attempt to pedal up the "giant of France" one of the epic climbs of the Tour de France. And it also happens that one of my favorite producers was a mere 10 miles from where we were staying. The vineyards of Domaine Fondreche provide a breathtaking and intimidating view of the Ventoux and produce a line of highly rated Rhone blends in the hands of winemaker Sebastien Vincenti. Winemaker Sebastian Vincenti talking about the unique soil type at Fondreche. Domaine de Fondreche is a 38 hectare property in a unique part of the Ventoux. The vineyards sit higher up on a plateau than any other in the appellation providing different soils and geographic positioning found nowhere else. Sebastian also farms organically, planting the local varieties of Grenache, Cinsault, Syrah and Mourvedre in the clay, limestone and silex soils. The syrah at Fondereche is a special clone called Serine. It is described as the ancient, local variety of Syrah, and it is markedly different from modern selections. Serine grapes are more oval in shape, with lots of space in the bunch and has lots of violet and perfume; very aromatic. The Cinsault is used exclusively for his amazing Provence-style rosé, no red wine is made from it. The Cinsault, used only for his Provence-style rosé. The old vine Syrah, a special clone called Serine that is described as the ancient, local variety. Because of our relationship with the winery and the importer, we were able to get our hands on a few cases of his reds and rosé at a reduced price. We also carry his mineral driven Rhone-style white, a refreshing yet full bodied blend of Grenache Blanc, Roussanne and Clairette. These are all super wines that are beautiful expressions of the unique terroir of Domaine Fondreche and the Ventoux. See the ratings and pricing below! Our tasting lineup at the winery. Along the same lines, quality wise, the 2011 Cotes du Ventoux Nadal, a blend of 45% Syrah, 45% Grenache and 10% Mourvedre, (Syrah and Mourvedre aged in barrel, the Grenache in concrete tank) exhibits gorgeously pure notes of creme de cassis, currants, licorice, sweet oak and chocolate that flow to a medium to full-bodied, rich and layered profile on the palate. Upfront, texture and full-flavored, with mouth filling amounts of fruit, it is a knockout effort that will deliver the goods for over a decade. The 2011 Cotes du Ventoux Persia is a beauty! A blend of 90% Syrah and 10% Mourvedre, aged in a combination of small barrels and demi-muids, it offers a stunning bouquet of cassis, vanilla, coffee and hints of flowers to go with a full-bodied, layered and beautifully textured profile on the palate. This terroir always shows beautiful purity, freshness and focus, and this vintage is no exception. Benefiting from a decant, it will ideally be given another year or so in the cellar, and enjoyed over the following decade. Pale onion skin color. Pungent red berry and orange pith aromas are complicated by hints of dried flowers and succulent herbs. Fleshy and dry on the palate, offering spicy redcurrant and raspberry flavors and a touch of tarragon. Closes with gentle grip and good persistence, leaving a suave floral note behind. Dessert at my parent's house during the holidays presents a dilemma as we have to chose between my mother's fresh pumpkin and apple pies and my sister-in-law's homemade pumpkin rolls. But since we are all such good dessert-loving-sugar-addicts, everyone take a small piece of all three ("small" being defined very differently by each of us), topping off the pies with a little whipped cream or ice cream. I always save the roll for last, the moist pumpkin spiced cake with its silky cream filling melt in your mouth and make it the perfect end to the perfect meal! Thanks Missy for sharing your recipe! 1. Preheat oven to 350 F. In a large bowl, mix together eggs, sugar and pumpkin. 2. In a separate bowl, mix flour, baking powder, and cinnamon. 3. Add the egg mixture to the flour mixture and stir until well blended. 4. Line a 10 1/2" by 15" jelly roll or cookie sheet with wax paper that extends over the lip of the pan. Pour the batter onto the cookie sheet, spreading evenly. 5. Bake 12-15 minutes or until a toothpick inserted into the center comes out clean. 6. Prepare a clean kitchen towel by sprinkling heavily with powdered sugar. 7. After baking, turn the cookie sheet onto the towel, the cake should slide out onto the towel. Keeping the wax paper, start at one end and roll up the cake up lengthwise into the towel. Cool 30-40 minutes. 8. While the cake is cooling, make the filling, by stirring together the cream cheese, powdered sugar, vanilla and butter. Mix well. 9. After the roll has cooled, unroll it, removed wax paper and spread the filling evenly over the cake. Roll back up without the towel. Wrap in foil or plastic wrap and refrigerate for at least an hour, or until filling is firm. 10. Sprinkle with powdered sugar before serving if desired. Ten years... As with most landmark events in our lives, reliving those raw emotions make it feel more recent yet with all that has happened it seems a lifetime ago. This weekend, August 29th, marks the ten year anniversary of the wrath of hurricane Katrina, the failure of our inadequate federal levee system and the near destruction of our city and our lives. Maybe we are different than most but Kerry and I don't want to look back, we don't want to see the exhibits, the photos and footage of what happened to our city and our homes. We don't want to reopen the wounds and relive the helplessness and hopelessness we experienced when our "super power" of a government failed to take care of its own and for days left people stranded without food or water. It was awful, it was heartbreaking and it so frightening to realize that everything you hold dear can be washed away in a day. We'd rather focus on the positive, how far we've come collectively due to continuous flow of people, money and energy that pour into the city. Our city is changed forever and the progress we've made would have taken 30 years instead of 10 in our dysfunctional slow moving southern culture. Our lives are changed forever, the people we know, the places we visit and the work we do have taken a path that otherwise would not have happened. Swirl, which has consumed our lives for the past 9 years, would probably not have happened, at least not in its current location. And it would be very different place because swirl is what it is by virtue of the spirit from which it grew. To all of you who weren't here yet, those were tough times in New Orleans. Collectively dealing with the destruction of entire neighborhoods, losing jobs, rebuilding homes, fighting with insurance companies, friends and family leaving the city in droves - we were all struggling to find our way. Returning and rebuilding were never even a question for Kerry and me. Our faith in our city and the resilience of its people were enough to keep us here; and as Chris Rose so appropriately stated, "the longer you live in New Orleans, the more unfit you become to live anywhere else..."
Just returning wasn't enough, we wanted to be part of the rebuilding, investing our hearts and our pocketbooks in our beloved, broken city. And I can tell you, it was an uphill battle and a drama filled start, but that's another story...! It was, and still is, the neighborhood support that kept us going. Because somehow through it all, Swirl became a place where people gathered and shared their stories, a bright spot in the midst of the post-Katrina madness to clear your head, rest your feet and have some good wine while you were at it! Well thankfully the conversations have changed since then, but the feeling in the shop remains the same - a friendly, comfortable spot to sit and relax with friends over a nice glass of wine; a place where you can bring your dog, your kids, your date or your grandmother to and feel good about being there. A special place, that you've helped us create filled with lots of great, positive memories over the years. And now, 10 years later, we have come so far. As people, a community and a city, we have persevered, flourished and now finally find ourselves settling in to a very good rhythm that we hope will continue for many more years....Thanks to all of you, our dearest friends, family, supportive customers, who have helped to keep us moving forward through it all. *PS - We might put on our evacuation clothes (yes we still have them!) and go to swirl for a drink on Saturday. Or we may just go on like it's any other day. I'll keep you posted! Awhile back I did a series of posts on our amazing staff, the heart and soul of the store. We've had a change or two since then so I wanted to update you on the current, hardworking, wine loving people who help us help you. While we can fill our space with great products, do good deeds through our community work and support local artists and businesses, it is our friendly, helpful, professional, knowledgeable team that truly set us apart! Because without the warm, positive vibe created by those who work here, Swirl would be just another wine shop! Erin Rhoads has been with us for quite awhile now. But when Matt Snyder departed for the greener grasses of Gentilly to focus on his family and true career, she decided to take on a bigger role in the shop. And we're so happy to have her! I grew up on a cherry farm in Northern Michigan, and after a brief post-college stint (German and Marketing major) at a wine bar in Edinburgh, Scotland, I spent 10 years in Chicago. I fell in love New Orleans before I'd even visited through the friendships I developed with Katrina-transplants who bided their time in the cold Midwest while their true homes were being rebuilt. If you have an open heart, it's easy to be woven into the fabric of the magical place, and that has definitely been the case for me. A couple of fun facts: I'm a classically trained violinist (although terribly rusty now), and a trained Pastry Chef. Gardening and cooking are two of my favorite ways to relax - I'm a huge homebody! I'm also a sports fan, and when I'm not rooting for the Saints, I'll be cheering on my Michigan teams. I also recently began volunteering as a Docent for school groups at The Ogden Museum of Southern Art and have been thoroughly enjoying viewing art through the eyes of children! Red: I'm a huge fan of all wines from Campania, but the reds are especially dear to me. I think that the volcanic soils of that region produce perfect "food" wines. White: The Columbard/Ugni Blanc/Gros Manseng blends from the Cotes de Gascogne are perfect for our humid climate. Rose': Provence is the classic region for Rose', but I've been really enjoying the richer Rosatos from Southern Italy this season. Red: The Alois Settimo from Campania in the Earthy/Zesty section is to die for. I recently had the pleasure of revisiting it, and have been kicking myself for not recommending it more! White: The El Perro Verde Verdejo in Crisp/Lively is a steal of a wine and perfect for a summer pool and patio gatherings. Bubbly: We just brought in the Pol Roger NV Brut and it's a delightful champagne: powerful and full-bodied, yet still finessed and balanced. The 2009 Travaglini Gattinara from Piemonte offers a light bodied Nebbiolo that is immediately drinkable and quite enjoyable, even during summertime in New Orleans! Mine is more of a Wine and Weather experience. I recently enjoyed a couple of glasses of the Broc Cellars Old Vine Carignan on the porch on a drizzly Monday evening. Sometimes rain is the best thing to pair with wine! One of the most rewarding moments in this business is reaching a point where you can break down complex concepts and theory into easily digestible chunks. I love educating customers. Of course, the more I study wine, the more I realize I have to learn. It is truly humbling. You can find Erin in the store Monday, Wednesday, Thursday, Saturday and every other Friday. We are also working on putting her culinary skills to use for our special events and private parties - more on that later!! Coffee in Italy is an art and its ritual a necessity of life. You won't find expensive fancy sweet coffee drinks served in giant go cups or milks from every source imaginable and more types of sweeteners than you can count. Coffee in Italy is simple - it is your fuel in the morning and your digestivo after meals. Because while the Italians aren't big on laws in general, food and drink are the exception and a little education on how it is done will go a long way on your next trip. So here are some steadfast rules and observations from one who honors the long standing tradition of true Italian coffee. "Bars" in Italy are cafes and they are everywhere! The are usually quite small and have only a handful of tables. A pasticceria is a pastry shop that also serves coffee. Usually you go to the register and pay first then take your receipt to the barista who will make your drink. If you want a brioche (pastry), a typical Italian breakfast, order that while at the register as well. If you order a lattè you will get a cup of milk, if you want coffee order a lattè macchiato or milk with espresso. If you order "un caffè" you will be served an espresso - unless you look like a befuddled tourist then your order will be confirmed, "Espresso?" An "Americano" is not American drip coffee but the Italian way to satisfy the needs of Americans who think bigger is better by adding water to shots of espresso and serving it in a large cup. Un cappuccino e brioche, a typical Italian breakfast! Un cappuccino alla mia cucina! And the best part? This delicious cup of heaven costs no more than $1.25 even in a touristy area! I hope this helps makes your next cup of coffee in Italy the wonderful experience it should be! "A great environment for an evening of wine discovery that was fun and informative. Will definitely be signing up for the next one!" "Dan was great! As anyone would expect, he is extremely knowledgeable. He provided a lot of information in a very accessible way. He broke everything down to a level that non-wine experts could easily grasp. There was not one bit of snobbery or condescension in his presentation. I am very much looking forward to the upcoming Somm’s Pick events." "We have been to many tastings at wine shops and restaurants over the years, and by far Dan's descriptions/mini-lessons combined with the Sommelier tasting sheet for the red blind were fabulous. We learned a great deal." "The quality of the wines were perfect - not too expensive, addressed the value, yet complex and interesting." "My knowledge of wine is incredibly limited, but with the Somm's pick, in one night I learned enough about wine to get seriously hooked. It was so enjoyable learning in a laid-back atmosphere. I can't wait for the next one." "I have been reading about, studying, taking e-courses, etc. on wine, thinking about trying to break into the business, and one of the most intimidating aspects is the sommelier exam. Dan made it seem possible, if still rigorous. I feel excited and more eager than ever to take my passion for wine to the next level. Thank you so much for staring this program." Swirl’s tasting and education series, The Somm’s Pick, puts you in direct contact with some of New Orleans' finest sommeliers. During their monthly presentations you'll have the opportunity to taste with them and discover wines they have chosen as some of the most intriguing in the market. Plus as a member of our Somm’s Pick Buyers Club you'll be able to purchase the wines at a discount and receive a special advanced notice for all tastings and events associated with the program. Sign up here for our email newsletter, a weekly rag on happenings, recipes, wine pairings, restaurants, travel notes and more! American wine consumption has been on the rise now for 20 consecutive years, in fact we've been setting records recently and the market is predicted to continue to grow. And as Americans are getting more and more into wine, earning the title of certified sommelier has become a hot career path. People are signing up for sommelier programs in droves and schedules fill up almost immediately when new training and certification dates are released. Movies, national and international "top somm" competitions and the media have brought an intense, almost cult-like focus on this once somewhat stuffy and obscure wine and service career. While there are many excellent wine education programs out there, there is no doubt that the title of "sommelier" is the most recognized by the American public. In terms of certification organizations it is the Court of Master Sommeliers that tends draw the most attention with its multi tiered system where different levels of certification are obtained through rigorous study, exams and blind tasting evaluations. To earn the title of sommelier students must first pass an introductory level exam to then be eligible to take the Certified Sommelier exam which entails written theory, demonstration of service as defined by the Court and blind tastings. This is just the tip of the iceberg as there are then 2 more levels in the Advanced and the coveted title of Master Sommelier. The post Katrina exploding New Orleans dining scene has brought with it a demand for wine professionals and there are probably more certified somms than ever before in the Crescent City. Helping to meet that demand, each year Commander's Palace hosts the Court of Master Sommeliers as a site for their workshops and exams, giving New Orleans service industry easy access to the program. Dan Davis, sommelier and wine director at Commander's has been a driving force behind getting more New Orleanians educated through CMS and hopes to offer two certification dates in 2015. At Swirl we have always tried to make it fun to learn about wine and I think our new program, The Somm's Pick, will be one of our best yet. Through our new tasting and education series at Swirl, we will put you in direct contact with some of New Orleans' finest sommeliers. During their monthly presentations you'll have the opportunity to taste with them and discover wines they have chosen as some of the most intriguing in the market. Plus you'll be able to purchase the wines at a discount should you decided to participate in our Somm's Pick Buyers Club. Our guest sommeliers will include Dan Davis of Commander's Palace, Liz Dowty of Square Root, Michelle Gueydan from Vino Solutions/Neat Wines, John Mitchell of the Windsor Court, our own Kimi Kivirana and more. We'll meet at the shop once a month to taste their selections and pick their brains on the who, what, when and whys of the bottles they've chosen. And if you have an interest in becoming a sommelier this will be the perfect time to learn what is involved with obtaining the title from professionals who have made it through different levels of the program. So here's how it works. The first Monday of the month my weekly newsletter will introduce a featured sommelier and their picks of the month. The next evening, the first Tuesday of the month, is The Somm's Pick Tasting. Our featured sommelier will be in the house from 6-8pm pouring their 2 wines which can be sparkling, red, white, rose' - sometimes it may be 2 reds, sometimes mixed, who knows? It's their call! The wines will be priced somewhere between $19.99 and $39.99. Plus we'll have a third selection from the shop that we'll pour blind to give you a little insight into how to evaluate an unidentified wine. It is $10 to attend the event, that will include tasting the 3 wines plus a free Reidel crytstal wine glass that is yours to keep. The wines will be available for sale starting that evening and will be featured in the store through the month. Then there's the Somm's Pick Buyers Club. If you decide to join, each month you will be billed for the 2 wines with a 10% discount for being part of the club. You can attend the tasting for half price and receive your free wine glass. If you choose to purchase more of the wines anytime throughout the month you will continue to receive the 10% discount. You'll also receive exclusive offers and discounts for any other events associated with the program. The best part is, there's no long term commitment or obligation - after the first 3 months you can cancel at any time! Intrigued? Our first tasting is on Tuesday, February 3rd at 6pm and our featured sommelier is Dan Davis of Commander's Palace. I'll have more details in next week's email, but mark the date, this should be one exciting kick off! It is a well known fact that we have an affinity for bubbles. A light, zippy style sparkling with fresh local oysters, a rich full bodied Champagne with a big juicy steak, a tasty cremant added to a cocktail, a celebratory toast - bubbles are one of the few wines we enjoy with or without food. And our selection reflects our passion - with 45+bottles to choose from ranging in price from $10 to $200, we truly have something for everyone! 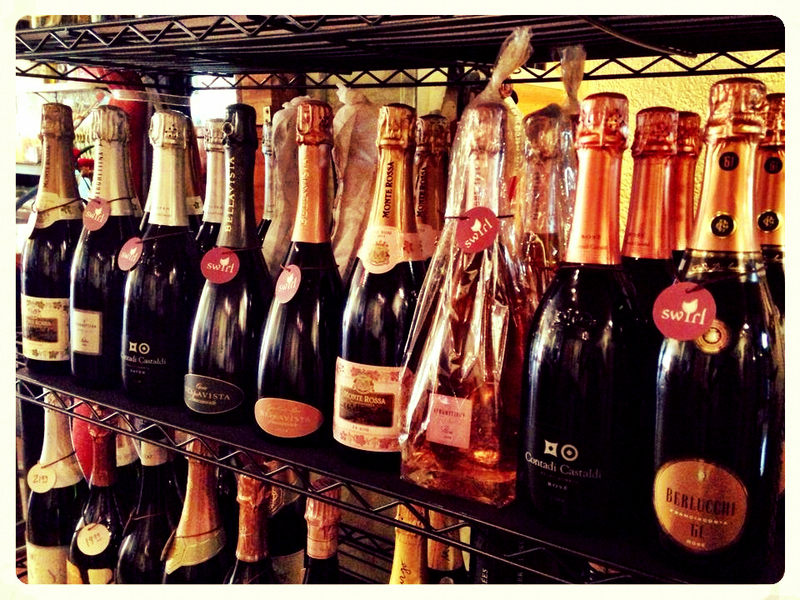 These are not your only options as California, South America and many other regions produce great sparkling wines. Once you get into bubbles there is a whole new world out there to explore! Have fun, experiment with different styles and different foods like a Lambrusco or Gragnano with Pizza, a Brachetto d'Acqui with a fruit tart, a Bugey Cerdon as an aperitif, a sparkling dry Shiraz with lamb - endless possibilities! Need a little help figuring out what to buy for your friends, family and favorite wine drinkers? Stop by and check out the local art on the walls, wine related gifts, chocolates, cheeses, and the ultimate gift, a wonderful bottle or two or three of their favorite beverage, beautifully presented in our elegant gift boxes! But we are not a grab and go store where hundreds of pre-shrink wrapped gift baskets are lined up filled with processed cheeses that don't need refrigeration and generic bottles of wine all dressed in pre-tied red and green bows. At Swirl, we're about thoughtful gift giving, nice wine and local products that we ourselves like to eat and drink. So give us just a few minutes of your time, we will help you pick the perfect gift and wrap it in something unique; we're here to make you look good! Here are some thoughtful gift ideas to consider and feel free to call us up - we'll figure out what you need, wrap it up and have ready when you arrive! 1. Artfully Local - Nothing captures the uniqueness of New Orleans like locally created and themed paintings, sculptures and works of art. Mass produced items by an anonymous person or machine can't come close to the energy and creativity of an original piece. Painted pieces by Shaun Aleman, paper mache sculptures by Brian Bush, glass tiles by Paulette Lizano, handmade leather masks by Julie Stefanski, and colorful "glam" okra art pieces by Jeanne Vidrine all line the walls of the store and start at just $12. 2. Gifts that Tell a Story - While we can make any bottle of wine look good in our black and gold carriers and boxes, we love putting together wines and items that have a theme and tell a story. One of my favorites is the "Passionate Sicilian" package that I created on Friday: highly acclaimed red & white wine from Tenuta Della Terre Nere plus a bottle of their delicious, small production extra virgin olive oil. Or maybe my "Drink Local" pack with wines by our two favorite local producers, James Moises and Vending Machine wines paired with a New Orleans Drink Deck containing discounts at 50 of the city's best bars and hangouts. My latest is the "Ratings Junkie" a 94 rated Washington State Red with a 95 rated Oregon Pinot, boxed and pretty for under $120... just tell us your budget and let us build you a beautiful gift! 3. "You're So Fine" Chocolate and Wine - Our relationship with local chocolatier Cheryl Scripter of Bittersweet Confections has been a long and tasty one! We were her very first retail account way back when and have been loyal devotees ever since, making a decision to not carry any other chocolates in the shop. Let us pair up a bottle of Niner Cabernet, a ruby Port or maybe a Bugey Cerdon with a box of her handmade truffles. Or we can pack up nice gift with an assortment of her smaller items like chocolate dipped salted caramels, peppermint bark or coconut clusters with a wine pairing or two! 4. A Day in the Life of Faubourg St. John - Pick up gift certificates at our favorite neighborhood spots and combine them for a truly unique experience! Start their day with tickets to an exhibit in the New Orleans Museum of Art or maybe a morning of kayaking on the bayou with Bayou Kayaks, then coffee and pastries at Pagoda Cafe or Fair Grinds. Next hop over to Lux Salon for a spa day of massage, mani, pedi or even a new 'do! Then to Swirl for a few glasses of wine and a cheese plate before dinner at one of our wonderful restaurants like 1000 Figs, Cafe Degas, Santa Fe, Lola's, The Half Shell and more. It's a great way to treat someone to all of the wonderful things our neighborhood has to offer! 5. It's the Little Things that Count - Sometimes you just need something special and small for a colleague or friend or maybe a little stocking stuffer for a family member. Our beautiful wood corkscrews, flour sack bar towels, vacuum pumps, wood cheese boards, Drink Decks and specialty olive oils are the perfect answer for $20 and under gifts!